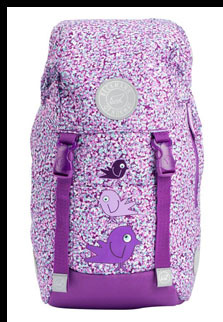 Young fashionistas will love the Beckmann of Norway "Lerke" Rucksack Nursery School 12L backpack with its pretty pink, purple and teal pattern and cute little bird design, while the high quality and the level of practical details will appeal to adults. Fashion and function are two of the key elements of Beckmann of Norway, a company that has been making high-quality backpacks since the 1950s with an emphasis on backpacks for school-age children. Luxury is all about the small details that go into making a great product, and this is something that Beckmann of Norway does very well. It is in fact, Norway's largest and oldest brand of backpacks. Solid design, well-built, and attractive to the eye make Beckmann of Norway a standout for children as well as for adults. In addition, each backpack undergoes "strict safety control and thorough testing" before it reaches the consumer, and backpacks carry a 2-year warranty. When I was looking for a perfect gift for a little fashionista on my list, I fell in love with the Beckmann of Norway Lerke Rucksack Nursery School 12L backpack; it was attractive, durable yet also lightweight, and upon closer inspection I found even more reasons to love it, namely the small front pocket perfect for storing little items, a side zipped pocket designed to hold a water bottle, and another long side pocket where I discovered a lilac shopping bag lined with the matching patterned fabric of the exterior of the backpack and the matching three bird design. The backpack's lilac interior has an ample pocket and lots of roomy space inside, while the drawstring top is easy to use to open and close the backpack. Also a nice surprise was finding the neon lime green rain cover discretely yet conveniently tucked inside the back flap to keep the backpack dry during in-climate weather, and can also be used to protect the bag from fading. In addition to being stylish, the Beckmann of Norway Lerke Rucksack Nursery School 12L backpack has a plethora of practical details. With a concern for safety, the backpack has reflectors on all sides and there is also a reflective design on the front pocket. Designed for ease of wear, the backpack has comfortably padded back straps, a cushioned back with breathable mesh covering, a chest strap, and a waist strap to help distribute the weight of the backpack to the hips. 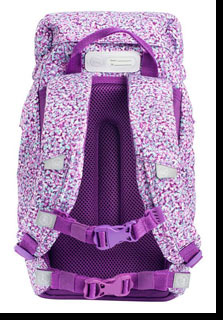 While designed as a school backpack, the Lerke Rucksack Nursery School 12L is sure to enchant whether used for school, for travel, or for play dates as toys or extra clothing could be stored in the backpack as well as carried in the shopping bag. The backpack retails for $77.99 USD. Beckmann of Norway also has adorable designs for boys, as well as highly desirable backpack designs for adults. For information on the full-range of products available in the United States from Beckmann of Norway for girls and boys, as well as for adults, please visit their website: www.beckmann-us.com. © December 2016. Luxury Experience. www.LuxuryExperience.com. All rights reserved.